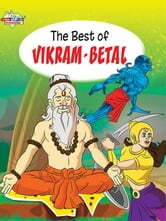 The stories of Vikram and Betal, originally written in Sanskrit, have been an integral part of the Indian fairy tales for many centuries. Legend has it that King Vikramaditya (Vikram), the Emperor of Ujjain promises a monk to bring Betal, the vampire as a favour promised to him. The condition is that the King should bring the vampire with complete silence otherwise the vampire will fly back with corpse to the tree. As soon as Vikram attempts to fetch the corpse, the vampire starts to narrate a story. And at the end of every story, it compels King Vikram to answer his question, thus breaking his silence. The collection of Vikram and Betal stories bring before the young readers some of the most amazing tales ending with a moral. Hope the children will enjoy reading them.